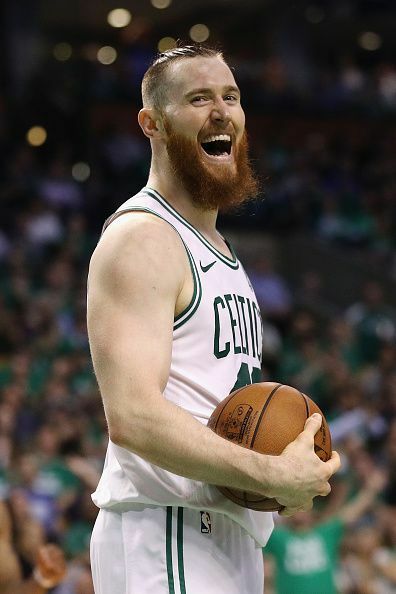 Aron John Baynes is a New Zealand-born Australian professional basketball player who plays for the Boston Celtics of the National Basketball Association (NBA). Baynes attended Mareeba State High School in Queensland. It was not until the age of 15 years, that he started to take interest into basketball. He accepted a college scholarship to play for Washington State University in 2006. In 2009, Baynes signed a 2-year deal with the Lietuvos Rytas of the Lithuanian Basketball League. He played for the Los Angeles Lakers’ summer league before parting ways with the Lietuvos Rytas. In 2010, Baynes signed a two-year deal with EWE Baskets Oldenburg of the German Basketball Bundesliga. In the 2010-11 season, he averaged 6.8 points and 3.7 rebounds in 40 games. He signed two more one-year deals with Ikaros Kallitheas of the Greek Basket League in 2011 and with Union Olimpija of the Slovenian Basketball League in 2012 before leaving in pursuit of an NBA contract in 2013. In 2013, Baynes was signed by the San Antonio Spurs. He was assigned multiple times to the Austin Toros of the NBA Development League in the 2012-13 season. He made his first NBA start in Game 4 of the first-round matchup against the Los Angeles Lakers in the 2013 Playoffs. The Spurs reached the NBA Finals that year but lost the series in seven games to the Miami Heat. Baynes recorded a career-high in playoffs in Game 1 of the Western Conference Semifinals against the Portland Trail Blazers with 10 points and 7 rebound as the Spurs went onto win the game 116-92. Baynes helped the Spurs reach the NBA Finals for the second consecutive time in the 2014 Playoffs and went onto win his first championship as the Spurs defeated the Miami Heat in 5 games. Baynes signed with the Detroit Pistons in 2015. He scored a then career-high 21 points in a 115–103 win over the Brooklyn Nets. In 2017, Baynes signed with the Boston Celtics. He scored a career-high in the regular season finale and led a short-handed Boston lineup to a 110-97 win over the Brooklyn Nets with 26 points and 14 rebounds. Baynes helped the Boston Celtics reach the Eastern Conference Finals of the 2018 NBA Playoffs where they eventually lost to the Cleveland Cavaliers in a grueling seven-game series.